Making sure you have the right cash cows is what this week’s trades are all about. The Milkmen get you sorted. With only 9 rookies scoring over 70 points in round 1, it’s going to be rare that all the rookies performed for your team. However, it would be rough for us to expect such high scores from all of our rooks so early on and it seems scores of 60 are the new par score. The season is long and remember to only remove those rookies you had high hopes for one week ago, if you have missed out on one of the key rookies who performed discussed below. Here was our take on how all the rookies performed in Round 1. The biggest name in the first game of the season from a rookie perspective was Paddy Dow (Mid. $271,000, 36 BE). Despite having multiple stints in the midfield, Dow, was still only able to put together 47 points and that was largely thanks to the 5 tackles he had. If you have Paddy in your team I’m sure there are concerns around whether he will hit his Breakeven in a few weeks time but remember his job security is what you paid such high money for and with an injury to Matt Kennedy that has only increased. Not one for the rage trade list. The only other rookie we saw in this game was Shai Bolton (Fwd. $228,000, 51 BE), who was always going to struggle to score well without kicking goals but we didn’t think it would be as bad as 13 points. If you have Bolton then it’s time to start making other plans. On Friday night we got our first glimpse of a future star in Tom Doedee (Def. $203,000, -8 BE). There had been a lot of question marks over who would take Lever’s role down back at Adelaide and, despite competition from Kyle Cheney and Alex Keath, Doedee got the nod for round 1 and went about securing his spot in the best way possible. He had 57 points between the second and third quarter a lone before finishing with 80 points from 21 disposals and 7 marks. In the space of one round he has made himself a must have for the rookie list. Those who started with Lachlan Murphy (Def. $176,000, 21 BE) instead of Doedee should look at making the switch after he only scored 34 points. The only real positive from Murphy’s game is that if he continues to play he will get dual position status at the conclusion of Round 5 as he spent a vast majority of his time up forward. Speaking of forward time for Adelaide, we also got to see what the star from JLT2, Darcy Fogarty (Mid/Fwd. $256,000, 30 BE), could do and for one quarter it looked like he was born to be a fantasy beast. Fogarty went in to quarter time with a goal and 22 points next to his name. He was only able to score 27 more points for the entire game to end up with 49 points from two goals. With Tom Lynch and Taylor Walker both a chance to return on Thursday night we may not be seeing Fogarty or Murphy in the seniors for too much longer so start looking in to other rookie options up forward. The unexpected star from the Saints vs Brisbane game was Ben Long (Fwd. $237,000, 43 BE). Long has added considerable size to his frame and was roaming the half forward line with great intent on his way to 68 points. Despite a couple of skill errors it was a couple of marks at full stretch that caught our eye. St Kilda pretty much had a full list to choose from for Round 1 and the fact that Long played, and played well, increases his job security considerably. One to definitely consider if you missed the boat in Round 1 as is he is looking to have a fantasy friendly role. It was surprising to see at the end of the game that Hunter Clark ($266,000, 31 BE) had made his way to 51 points as he seemed to be rarely sighted. This could be a good thing for those with Clark as he seemed to fit in seamlessly despite playing all over the ground. What is not promising is the fact he only got 62% game time, his goal came from a pass in to him in the goal square and Luke Dunstan is sitting in the wings deserving of a spot. Our take is to keep him if you’ve got him but if you don’t then no need to worry about finding a way to bring him in. Another key debutant that didn’t perform quite as well from a fantasy perspective was Cameron Rayner (Mid/Fwd. $268,000, 45 BE). Outside of his classy goal, Rayner also took a great contested mark but the highlight reel really finished there as he scored only 35 points. Luke Hodge has come out this week and said that he is a huge fan of the future star and we are sure the coaching staff are on the same page, so there’s really been no harm to his job security. We also said you’ll need to be patient with Rayner and nothing has changed. We understand he is one more poor score away from being traded out by a lot of teams but we will be keeping him in our squads. From one top draft pick to the next and Andrew Brayshaw (Mid. $272,000, 38 BE) was another that didn’t give the output that we coaches wanted with only 45 points from his 12 disposals. Brayshaw did have his fair share of midfield time though during his 66% game time which was both expected and promising for those coaches with him. Coaches should look to hold him for one more week. Another player to put in to this category is Bailey Banfield (Mid. $187,000, 7 BE) who outscored his counterpart with 54 points from his own 12 disposals. Banfield spent a lot more time on the field with 82% game time and the fact he is more kick happy then Brayshaw was the reason for his higher score. We currently have both players in our team and won’t be trading them out but Banfield is the clear pick if you only want to have one of the dynamic duo at Fremantle. It will be interesting to see who makes way at Fremantle once Stephen Hill returns. Alex Pearce (Def. $208,000, 17 BE) did exactly as you can expect week to week. Pearce played as a key defender on Charlie Dixon, rarely resting on the bench and scored 48 points. Expectations on Pearce’s scoring was never going to be high but his job security is one of the best out of all the rookies we have. When there is a game that Freo dominates (if that does occur), you can expect to see a score a lot lower from Pearce as it was only massive supply in to their backline that saw him able to score above 40 against the Power. The question marks around Dom Barry (Mid. $198,000 -4 BE) was always going to be for his job security and not his scoring potential. He went about securing his spot in a big way as he had 22 disposals and 72 points. He was a key part of a lot of Port’s scoring chains and even copped a mention from Hinkley in the post match conference about his performance. Port won’t be playing Fremantle every week but if Barry plays this week after Robbie Gray returns then it’s going to be hard to see him losing his spot. If that is the case then despite us saying to hold on to Dow and Brayshaw then if you have both it may be worth moving one of those players down to Barry. One player that has made himself a must have is Nicholas Holman (Mid. $208,000, -15 BE). For those that follow us on twitter you will know how much of a fan we were of Holman in the pre-season. We felt like proud farmers when one of our top cash cow options tackled his way to 89 points. That’s right, Holman had 13 tackles which was the exact same amount of disposals that he had. We aren’t getting too ahead of ourselves though as players scores from the game have to be taken with a grain of salt due to the absolute bath conditions. Despite this, Holman is simply a must have for your midfield. This is despite the inevitable return of Aaron Hall and Michael Barlow at some point in to the team. Popular rookie selections in Luke Davies-Uniacke (Mid $258,000, 49 BE) and Ben Jacobs (Mid $244,000, 36 BE) were severely disappointing with only 27 and 37 points respectively. If you have luxury trades this week then there is no harm in getting rid of either of these guys. As discussed before with Holman, the game was played in horrible conditions so it’s not the worst thing to have a look at the cash cows once they are under ideal conditions at Etihad stadium this weekend. If there is no sign of improvement then they will be top of the chopping block for sure. Another star rookie from the first round was Collingwood’s Sam Murray (Def. $200,000, -7 BE). Going in to half time the great hope down in defence was on 52 points but reduced game time in the second half saw Murray end up on 76 points. There were some definite skill errors early on but it was the amount that the Pies players were feeding Murray the ball out of defence that had us most excited. Was a lock before round 1 and has made himself a must have now by backing up what we knew he was capable of. Will only score more as his game time increases and the Pies start seeing more of an onslaught of ball sent in to their defensive half. 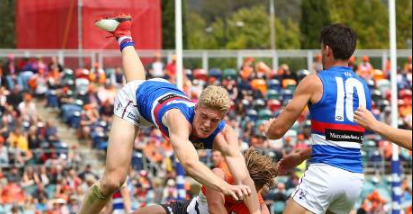 We were very impressed with Jaidyn Stephenson (Mid/Fwd. $274,000 BE 26) and his score of 61. Stephenson played all over the ground and didn’t seem to run out of gas which is impressive for a rookie. His tally of 16 disposals included 4 inside 50s and 2 rebound 50s which reflects his ground coverage. Coaches were scared off from Stephenson due to questions marks around his job security. Those question marks still remain with names like De Goey, Oxley, Blair, Greenwood, Brown and Elliot still waiting in the wings. A hamstring injury to Josh Smith will help him secure a spot for Round 2 though. Another one that coaches with him can be happy to keep for now and even play on the field. Those of us without him don’t have to put him top of the priority list to bring in. The biggest surprise packet of the weekend for us was the game of Tim English (Fwd/Ruc. $217,000, -4 BE). He has gone from a player we saw as the best option for the second bench ruck spot to a genuine player you can consider on the field as a forward rookie after scoring 78 points against quality opposition. It seems that English has spent the summer only focusing on leg weights as he is still quite thin up top but he provided great ruck support for Roughead. The other rookie you must consider bringing in after watching the GWS vs Bulldogs game is Jeremy Finlayson (Def. $194,000, 1 BE). Playing predominately in the backline it was perhaps lack of supply down there that halted Finlayson from scoring more as he was playing the fantasy friendly role of a roll off defender. With a big win coming in Round 1 and another match they should win in Round 2, his job security in the short term is good enough to see at least a couple more promising price rises. Those who picked Alex Pearce over Aaron Naughton (Def. $257,000, 37 BE) would be happy after Round 1. Although they scored similar Naughton did not look too comfortable down back. Perhaps being a victim of circumstance as GWS ran all over Bulldogs, he was caught out of position a fair few times. Luckily for owners of Naughton he is not going anywhere soon due to the depleted Dogs backline. Hold for now or look to switch to Pearce if you want only one rookie in your defence who is there for their job security alone. Zac Langdon (Fwd. $188,000, 7 BE) was clearly nervous at the start of the game but got better as the match wore on. It was great to see him line up in the team alongside Sam Lloyd as we were concerned there was only room for one. He played the defensive forward role that’s expected of him with a lot of pressure acts and he used his 6 tackles to help him get to 55 points. The problem with Langdon is his team won by over 80 points and he only managed such a score. With Scully due to come back he only might just hold his spot if at all. You really can’t expect high scores from him and he will better serve your side from the bench. The biggest surprise debutant from the clash and even the round was Billy Gowers (Fwd $187,000, 9 BE). It seems like every year Beveridge chucks a few rookies at us that we didn’t see coming. Be weary that he also has a good habit of constantly changing his line-up with the new names being the most vulnerable. Gowers definitely did enough to get another go at it in round 2 with 9 of his 10 possessions being contested and scoring 53 points. He is another of those mature age recruits that we fantasy coaches love . Gowers stems from the Footscray VFL side and averaged 67 points at reserve level last year. It seems he’ll be contending with Tory Dickson for a spot but congratulations to those who were brave enough to pick him as you have a cheap rookie that will continue to play in the short term. With so many injuries in the Bulldogs lineup, Fletcher Roberts, was asked to fill one of the key position voids down back. Standing next to Patton the amount that the ball was in their defensive 50 saw him able to get 14 possessions and 51 dreamteam points. Although he was serviceable and has good job security in the short term, there are players that will give you similar output for cheaper. Some of which most teams will already have in their side in the shape of Alex Pearce or Aaron Naughton. There was so much to take away from the Geelong verse Melbourne game from a rookie perspective so let’s start from the top. Zach Guthrie (Def. $266,000, 4 BE) defied all our thoughts about his ceiling when he got to 84 points. Looking at the team sheet it’s hard to see who takes his spot, in fact the injury to Taylor has only assisted with securing his position in the back six. Zach played 9 of the last 11 games in 2017 and has most importantly added some playing weight over the pre-season. You have one more chance to grab Guthrie before his price is too high. We are sticking with him out of our sides as we’re not convinced that he will get 22 disposals every week, but that’s unfair on the guy after such a strong game and JLT series. One player that 33% of teams are stoked to have selected is Tim Kelly (Mid. $253,000, 4 BE). It’s hard to see him going anywhere as he was roaming between the wing and half forward with some stints through the midfield. What more could you want? Well if it’s anything, it would be having someone that is composed while playing that role, and Kelly was just that! It looks like he will play a complimentary role to the star studded midfield and all the talk about him taking Steven Motlop’s role has been backed up after one round. It’s not to late to grab him and he should be a top priority for those who can afford the $253,000 price tag and don’t have him yet. A favourite of the Milkmen who looked great out there was Lachlan Fogarty (Mid. $251,000, 10 BE). Although he would be high on the chopping block at the selection table following Dangerfield’s return, he did his part to try keep his spot with 20 disposals, 4 marks and 1 goal for 70 points. Like Kelly, he too floated between the forward line and midfield. The job security of Fogarty is a constant debate amongst our duo but the end result is that if you have Fogarty you wouldn’t be trading him out but you can only afford to have one out of him and Kelly. From the first goal of the Geelong and Melbourne game it was hard not to be impressed by Bayley Fritsch (Fwd. $236,000 5 BE). Fritsch is a clear important link in the chain for the Demons and that was justified by the fact he spent 87% of time on the field. If you aren’t one of the 44% of teams that have Fritsch then get him in as he’s playing a great role in a good team. Something that is normally a recipe for success from a rookie perspective. The only rookie from the game that didn’t impress was Esava Ratugolea (Fwd $178,000, 16 BE). Despite being around the ball , it surprised us a lot that he only managed 39 points. Ratugolea did kick a major, but the other 7 possessions he had were not convincing and he really won’t last too long with Rhys Stanley waiting for his chance. Look to trade him to a Fritsch, Long or English if you have such a chance. There was three Eagles who made their debut on Sunday evening at the new Optus Stadium. Liam Ryan (Fwd. $231,000, 21 BE) scored 51 points, Jake Waterman (Fwd. $181,000, 13 BE) had 44 points and Daniel Venables (Fwd. $175,000, 21 BE) fumbled his way to 33 points. The most impressive of the bunch was Liam Ryan. Again we got exactly what we were expecting in one of our rookies with Liam Ryan. The crowd lifted whenever he was near the ball and although he only kicked one goal, he did look real dangerous in patches. It’s the same story with Ryan though, perfect for your forward bench, as there will be some real quiet game,s but enough scoring opportunities to generate cash for your teams. Jake Waterman tried hard but is really just standing ground until the inevitable return of Josh Kennedy. It’s still a pass from us, although news has come out that Kennedy won’t be back until Round 4 or 5. The most concerning rookie currently in our side is Venables. Although he started in the midfield which was promising, nothing really went right for him from there. He seemed quite lost in the speed of the game and fumbled a fair few times with 3 of his 7 possessions being Clangers. We hope that he gets another chance but the reality of the situation is that he needs some more time in the WAFL to find his feet. Unfortunately we don’t have much to put in to this section as there was only practice matches in all reserve level teams this week. With hard to access stats, it’s only word of mouth we can go off at this point. Nicholas Coffield (Mid/Def. $256,000, 40 BE) was the most surprising omission out of the round 1 rookies. He had 17 disposals in the practice match against Williamstown but was outshone by his defender couterpart Bailey Rice (Def. $170,000, 27 BE) who had 24 of his own touches. It’s hard to see Coffield being named this week after a win for the club with no injuries and we will need a fair few more price rises from our other rookies to make money moving to Coffield once he finally does play for the Saints. Here’s hoping we don’t see him until the middle of this year. With Mitch Robinson and Daniel Rich looking to miss out at Brisbane’s Round 2 clash, there is a good chance of us seeing Zac Bailey (Mid $242,000, 38 BE) get a run. Bailey pushed for selection with a strong showing in the practice match at reserve level. The injury to Josh Smith at Collingwood may also have opened the door for Brody Mihocek (Def. $170,000, 27 BE). Although as mentioned before when discussing Jaidyn Stephenson there are plenty of other names at the Pies that could easily come in to the team. Other key rookies who performed well in the practice matches were Jack Higgins (Mid/Fwd. $238,000, 37 BE), Brayden Ainsworth (Mid. $208,000, 33 BE) and Adam Cerra (Mid. $262,000, 41 BE). Fremantle actually released stats from their reserve level practice match. Cerra scored 94 points and Hugh Dixon (Fwd. $184,000, 29 BE) kicked 6 goals and scored 100 points. Ross Lyon has also confirmed that Cerra will debut this Saturday. Cerra, who was pick number five in last years national draft gathered 24 disposals and kicked a goal. At that price, we don’t recommend jumping on. There are better options available in the midfield. From next week we’ll have a much better idea of what rookies are pushing for their claim through the reserves as we look to bring you all the scores we can find for the key rookies in one spreadsheet. There’s been an amazing amount of support and questions coming through on Twitter. From next week on we plan to answer some key questions for the week ahead from twitter on this post so please send them over to us at our twitter handle of @TheMilkmenDT. For those of you that play Real Dreamteam, most of the information written in this post definitely holds suit. However, Jarrod Gartlett, is a must have rookie in that format of the game. Despite scoring 74 points, he has only one more game of being available at bottom price and will be given every chance at the Blues this year. 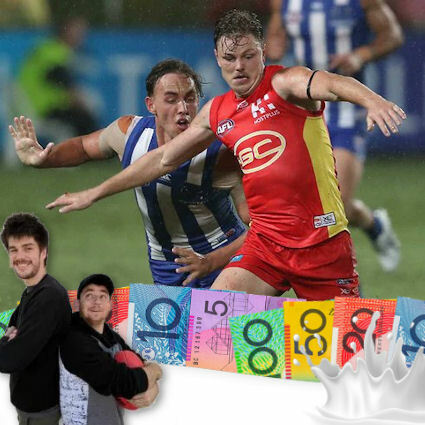 FOLLOW US ON TWITTER:@TheMilkmenDT specialising in cash cow selections but still here to talk all things AFL fantasy. None of them, unless you have someone lesser to trade to Kelly. 2) might be ok. Z.Guthrie’s JS is worse than Naughton’s, but he’ll make more in 2 weeks than naughton in 4 plus get you more points, so it could well be worth it. I guess 3) would put English in fwd? Might be an ok idea. But if Frampton is rubbish, they might just not play with a ruck a la Melbourne last year, with Dixon, Westhoff, Howard, and occassionally Watts sharing the role. Remember, in particular, that Dixon played as a second ruck at GC early in his career, so could fill the role if necessary. Very detailed work boys, well done. Thanks! Probably worth saving the trade if you have those four. Well selected rookies! Happy! Got rid of Jacobs that tagging nobody, and also the Adelaide Fog, who couldn’t score in a house of ill-repute. Ripe for the Picking – Where’s the Value?